Has any sports car manufacturer ever remained truer to its heritage than Porsche? Porsche has single-handedly built an 85-year legacy out of performance-minded engineering while designing some of the most endearing cars ever produced. If you're looking for a cool modern car that's comfortable, sporty and virtually guaranteed to be exclusive, this low-mileage Panamera is it! This is a great gas saver here! A 2006 Chevrolet Cobalt LT with a fuel efficient 4 cylinder engine and an automatic transmission. This would make a great first car for a teenager or a reliable little car to save you on some gas. It has power windows, power locks, cruise, AM/FM/CD. It has good tires and brakes and drives out great! 117k miles. We have another reliable little Honda. This is a 2009 Honda Civic LX sedan. It has only 53k miles and is in beautiful condition inside and out. It has gray cloth interior, power windows, power locks, cruise, AM/FM/CD/Mp3, with an automatic transmission. It is very clean and drives as a new car. it has good tires and brakes and will make it's next owner very happy! 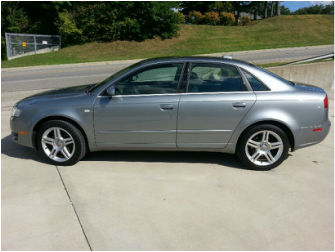 This is a very nice 2006 Audi A4 Quattro 2.0T Sedan. It is a great little all around vehicle because it gets great gas mileage and is also all-wheel-drive to get you around in the winter. It is in excellent condition inside and out and is sporty and fun to drive. It is equipped with a automatic transmission, leather, sunroof, premium sound system, heated seats, heated mirrors, power seats, power windows, power locks, and all wheel drive. It starts runs and drives beautifully and has 132k miles. 1973 Corvette with only 33k miles! This is a beautiful #'s matching & ALL ORIGINAL 1973 Chevrolet Corvette with only 33,200 documented miles. The original paint is Dark Blue Metallic with a beautiful Medium Saddle Leather interior. There has never been any paintwork on the car and the paint is in excellent condition. The interior is also in excellent condition. There are no rips or tears in the seats and the carpets are clean. There are no odors and the car has never been smoked in. This Corvette is well optioned with Air Conditioning, Power Brakes, Power Steering, Turbo Hydra-matic Transmission, & L48 Turbo-Fire 350 with 4 BBL. This very special Corvette is completely documented and has all original paperwork with the car including the Original Window Sticker, Original Owner's Manual, Brochures, Build sheet, Bill of Sale, and the Original Title. 1973 was the last year for the chrome rear bumper and the first year for the newer style front bumper. In 1973, the original owner also purchased the (1973) Kelsey-Hayes wheels and the American Racing Lug Nuts and Center Caps from the dealership that are currently pictured on the car. The OEM wheels that were on the car when it left the showroom are also included in this sale along with the original Firestone, GR70-15 tires that were recalled by GM but the original owner never turned them in for replacements. Having these original tires with the car would score a lot of points if you were interested in showing this car, but you could not drive on them safely above 10 mph. The car starts, drives, and sounds beautiful with absolutely no issues. This Corvette was purchased new in 1973 right here in Batesville, IN and had the same original owner for 39 years. This Corvette is truly original and was meticulously taken care of throughout it's entire life. This is a collector quality car that is sure to be a great investment. This is a very nice 2010 Ford Fusion with 65k miles. It is being sold on consignment for the original owner. Come test drive it today and see how nice it is. This 2009 Chevrolet Suburban is the ultimate family vehicle. It has plenty of room for the kids and everything you want to haul along with you. This is the LTZ model and is loaded with leather heated seats, power everything, towing package, and four wheel drive. It has been well maintained and has 104k miles. This is a wonderful and reliable 2010 Honda Accord EX-L. It is loaded with heated leather seats and power everything. It runs and drives perfect and is ready for its new owner to enjoy for many more miles. It has 70k miles. Please call before it's gone! This 2009 Honda Civic is in excellent condition inside and out. It is very clean, non-smoked in, and has no dents or dings. It drives just like a new one and has just been serviced and is It has 53k miles and drives perfect and is ready to get you where you need to go while saving gas and getting you there safely. What a great affordable classic car. This Nova has been restored inside and out and has a "built" Chevy Small Block motor and automatic transmission. It's a fun cruiser that could be a great show car or easily made into a unique daily driver. This is a whole bunch of car for the money! This great little 2006 Audi A4 Quattro runs like a top and drives beautifully. It has leather, heated seats, premium sound, and the famous Audi all wheel drive Quattro system. It has been well maintained and is very clean and ready for it's new owner. 132k miles are on the odometer but you would never know if you come take a look. This red 2000 Porsche 911 with factory Aero Kit is such a blast to drive. This 911 has been very well taken care of and has been well maintained over its 108k miles. The 100k miles full factory service has been completed and it is ready for the new owner to enjoy! This is an eye catching 1994 Dodge Viper with only 40k miles. It has a powerful 10 cylinder engine and is a hoot to drive. If you are in the market for a fun and unique car at a reasonable price, then you've found your next car!